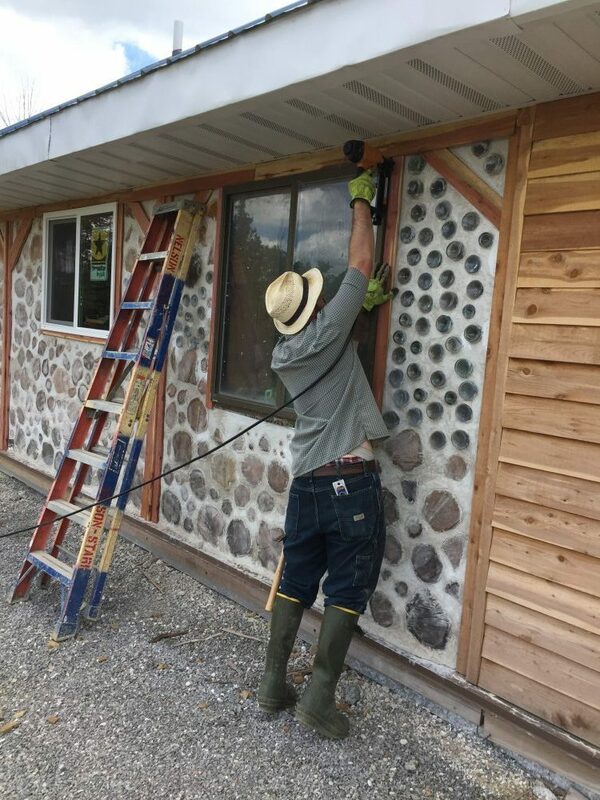 Building an off grid cordwood home is easily the craziest DIY task we’ve ever taken on, and after the months of April and May, we were ready to jump right into June! 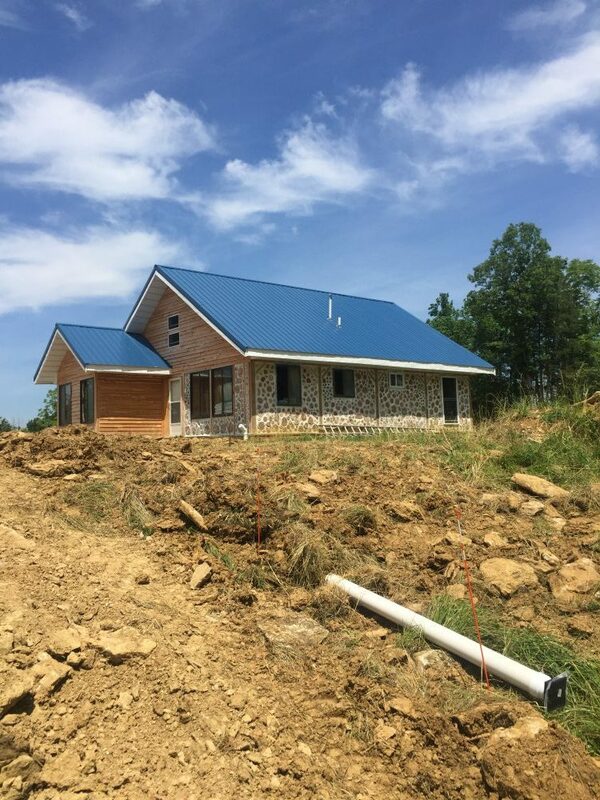 While I have left my job as a teacher, Mark is still working in his, which means the months of June and July are our best shot to make a huge push towards getting the house done before he goes back to school in August. This is also the one year mark of our first big building push and monthly building update! 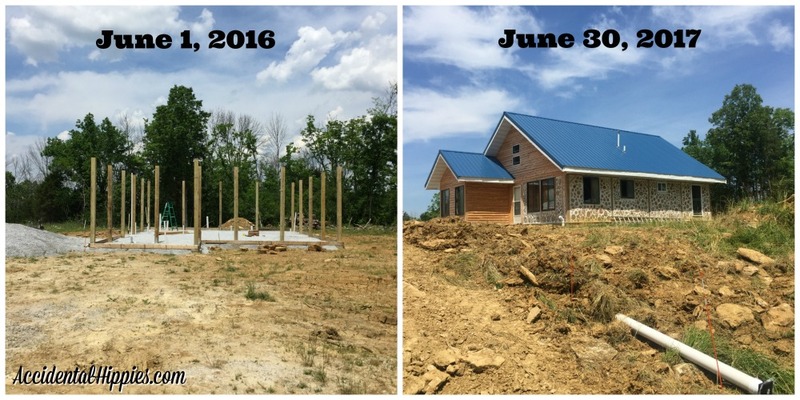 Last year on June 1st we had the footers, the rough in plumbing done, and the posts up. This year? Well, take a look! Wow! If you had asked me three years ago when we started looking for property if I thought we’d have the skills to build this, I’d have told you NO. Looking back at it now, it’s clear that if you have a willingness to learn and a strong work ethic you can do anything you set your mind to. So what did we accomplish in the month of June THIS year? 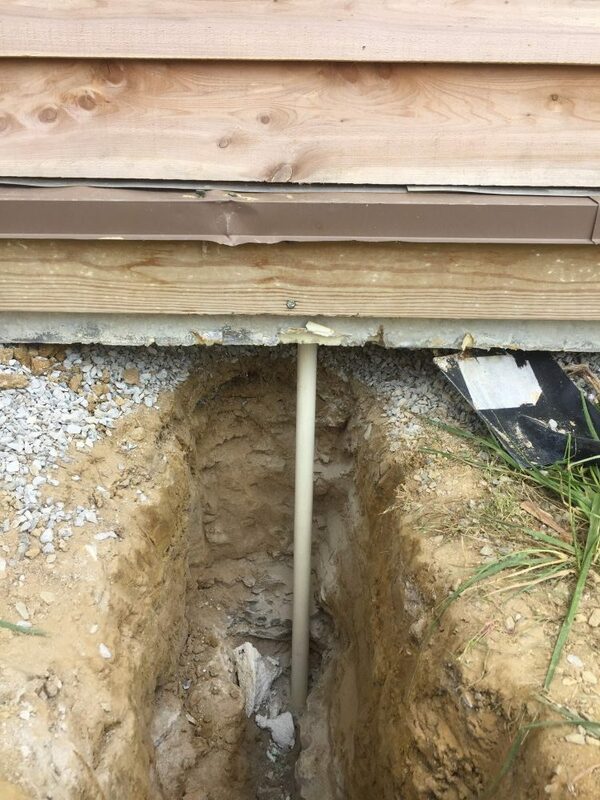 We ran all of the drain lines through the slab by ourselves last year and left everything stubbed out. Mark connected the vent stacks together and ran them up through the roof vents (which were installed last year when we did the roof). We tested for leaks by filling it with water. The few leaks we found were easily sealed. One question I got way back when I posted this great tutorial on making and using bottle bricks was, “What happens if one breaks?” Well, for better or for worse we got to find out! I’ll do up a detailed write-up on this separately, but the short story is that a new bottle, some mortar, and Liquid Nails are your best friends for patching this up. The windows needed trim, so we used the leftover cedar boards from when we did our cedar siding. Mark also wanted to cover up the treated posts to make them look nice and limit exposure to the treated lumber, so he did that too. I mortared the gaps to limit infiltration from pests, water, etc. 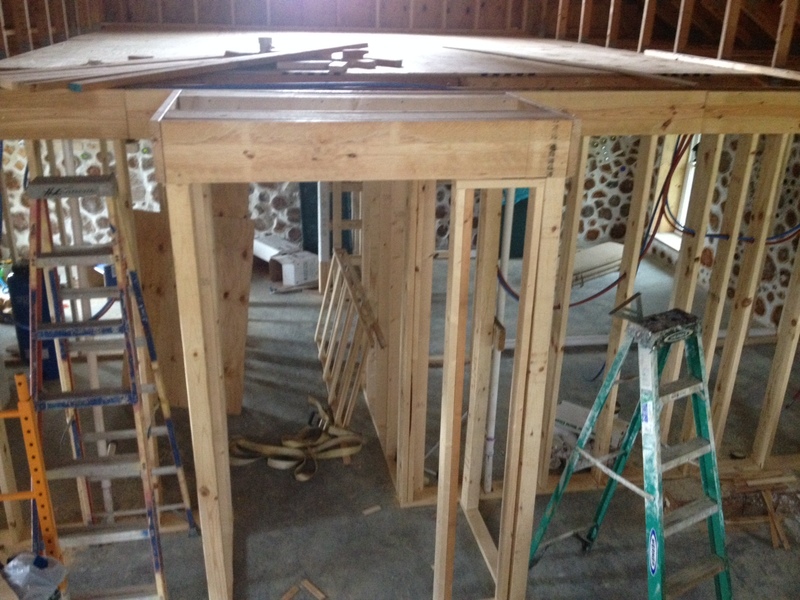 This is one of those jobs we did while waiting to do OTHER jobs, so the entire house trim isn’t quite finished yet. It isn’t a high priority since it isn’t necessary for the next inspection, but it IS nice to be able to get some of the extra cedar out of the way in the meantime. Finally! We can get to the loft without awkwardly ascending the ladder! 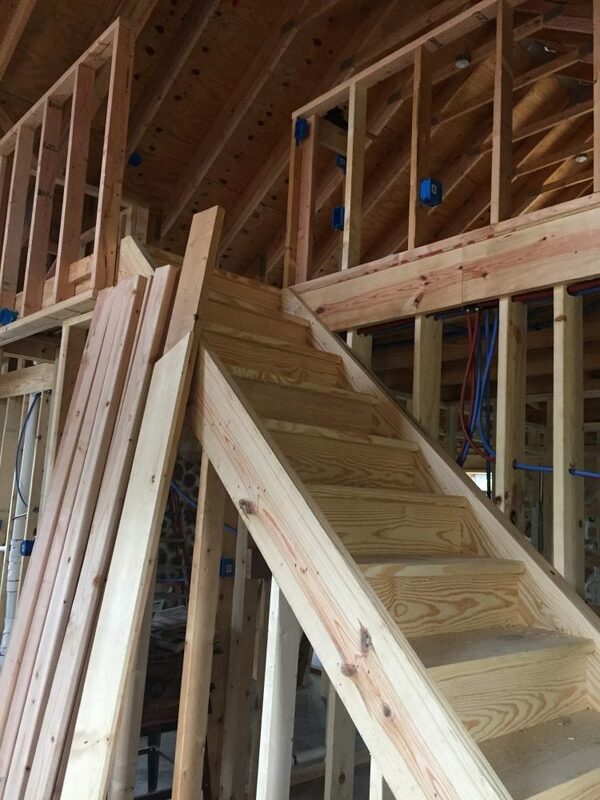 We ordered a staircase from the same local lumber company that supplied our framing materials and hauled it to the house on our trailer. These stairs are quite heavy, so a few strong friends helped hoist them into place. Rather than doing a railing we’re opting to build actual walls. This means we can run electrical outlets through them and have a little bit more privacy from those on the main floor without closing everything in. You can see these in the photo above. 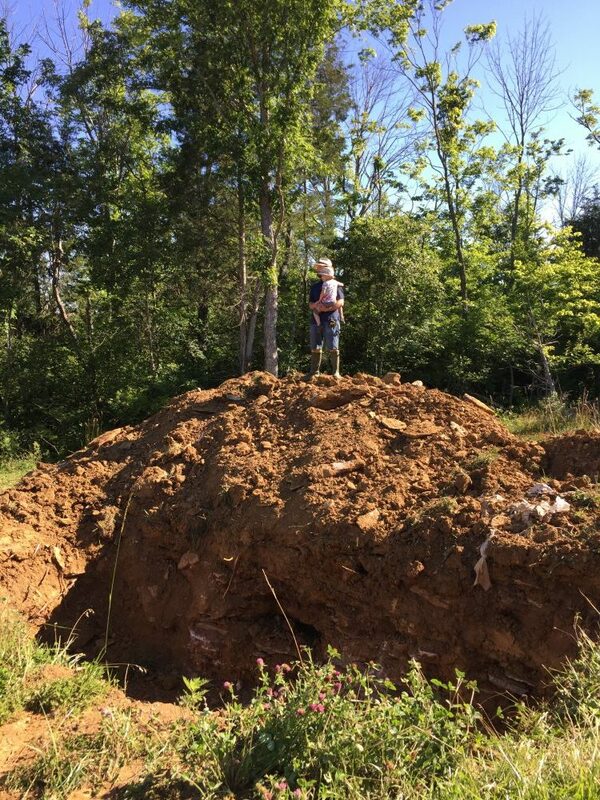 Two years ago when we bought the property we learned that in order for us to build on the property we first needed a septic permit. We had the leach field built first since we had to do what is known as a “fill and wait”, which means that topsoil is filled in and then you wait one year for it to settle before you can use it as a leach field. 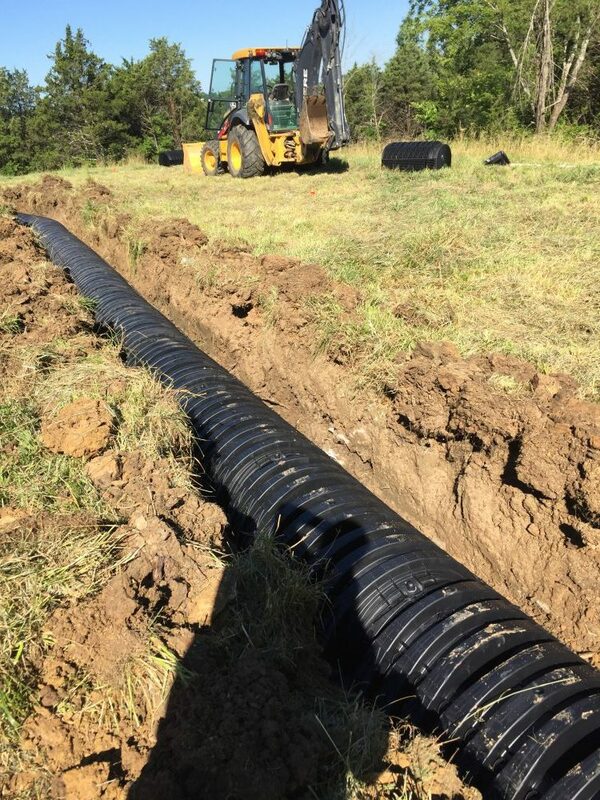 Having waited nearly TWO years at this point, it was finally time to have the septic tank and leach lines installed. 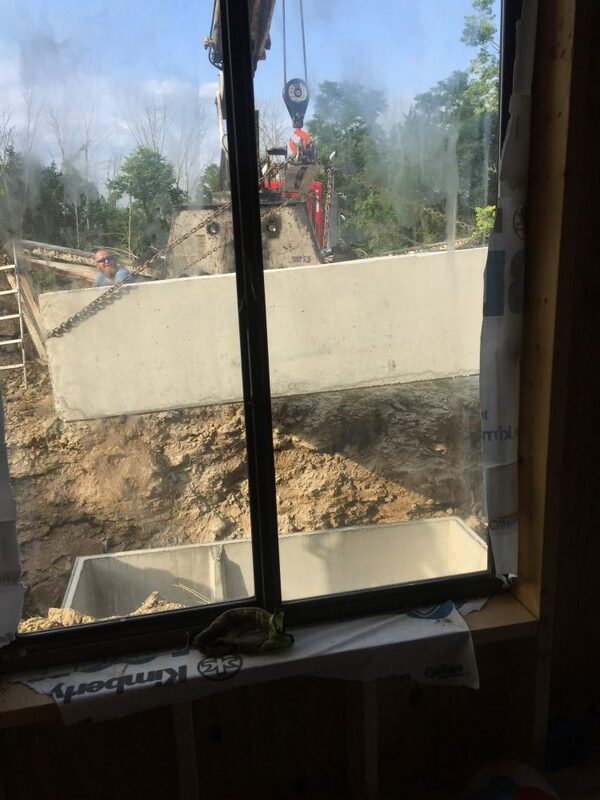 Our friendly excavator really came to the rescue on this one. 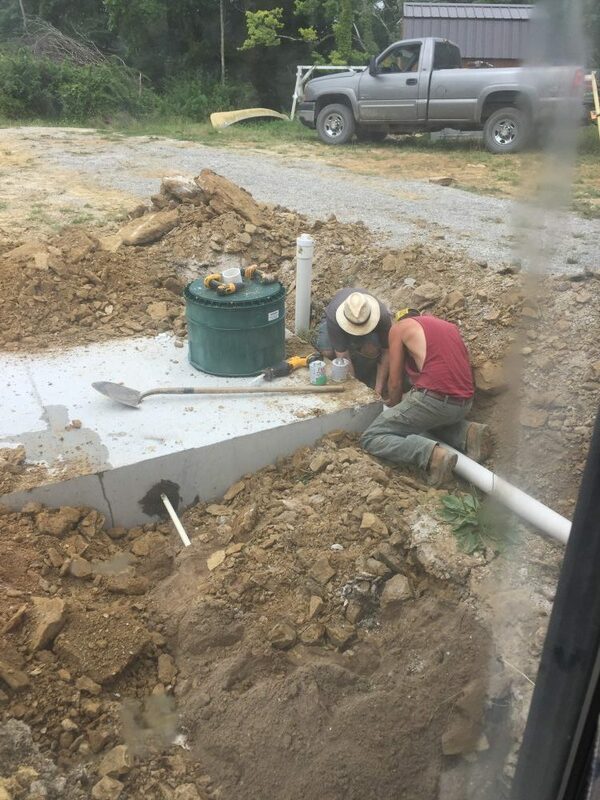 In the process of doing the septic, we learned that our proposed cistern location was too close to the septic tank to meet code, so we moved the cistern location to the front of the house. 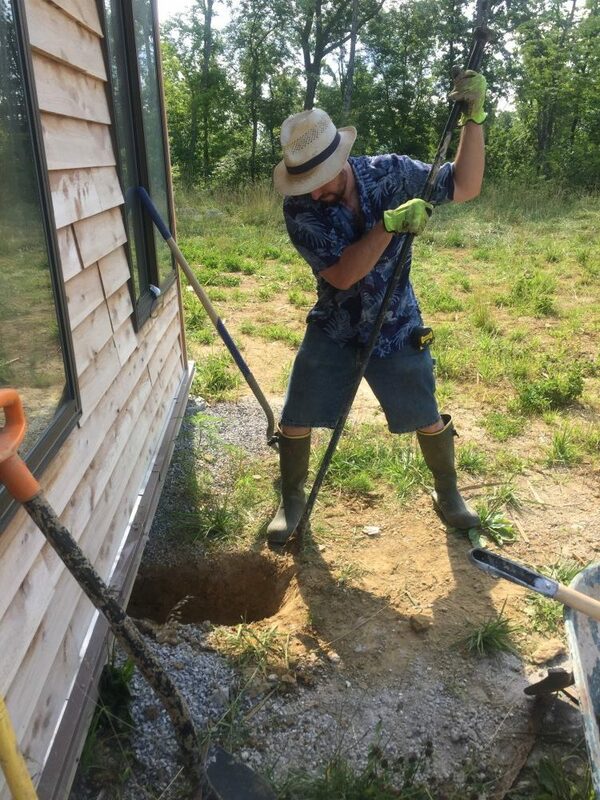 Next, Mark drilled a hole through the foundation to meet the hole we had just dug out. 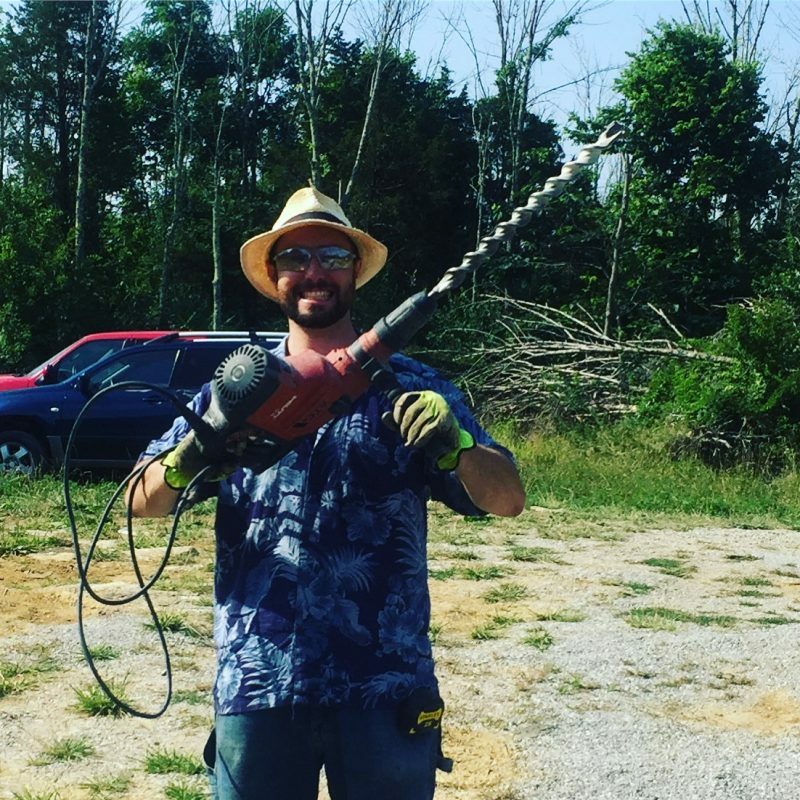 We rented this drill from one of our local hardware stores for the day to get the job done. I’d say he enjoyed it a little bit! 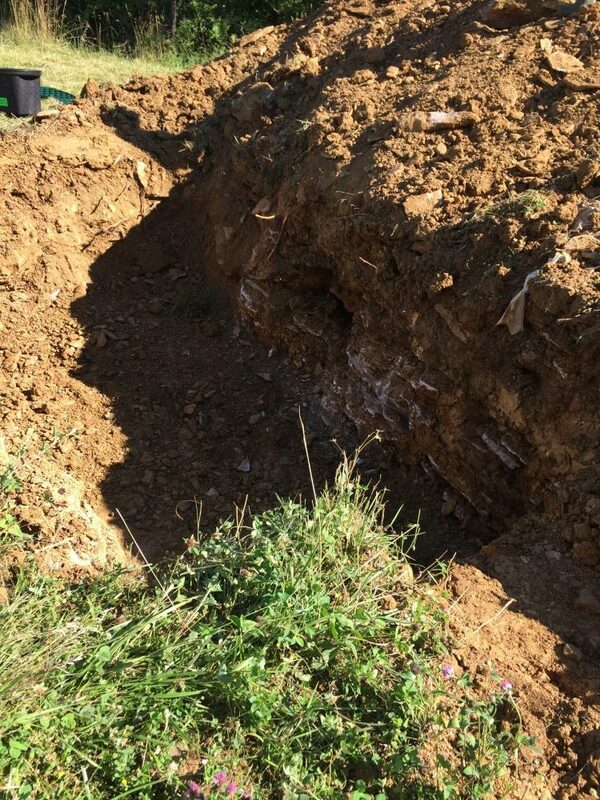 Our friendly excavator dug the cistern hole and helped us install everything. 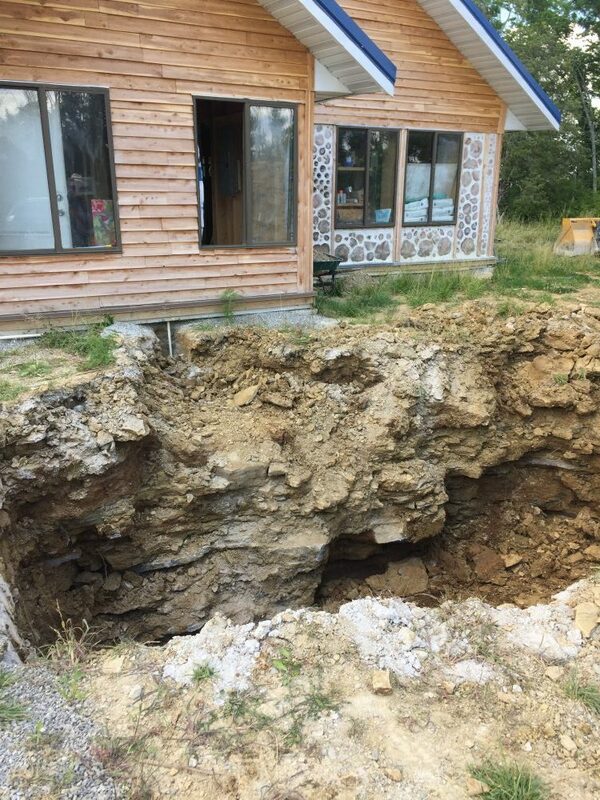 This hole looks like it’s going to eat the house! Also, I’m not sure there’s any better explanation for why our property is called “Big Muddy ROCK” than the above photo. 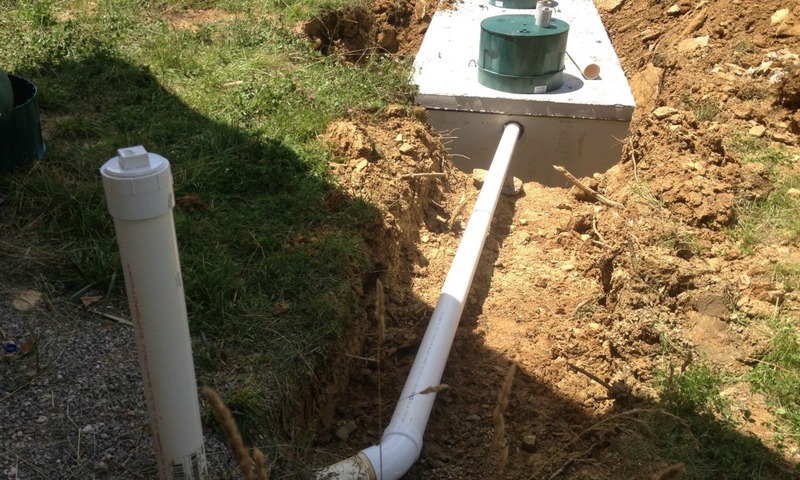 Here’s where the cistern overflow exits roughly 52 feet away from the house. The dirt and rocks will settle over time. I can’t imagine taking on this job without someone as knowledgable as him to help us through. Everything worked out fine in the end, but this job had us a little worried. A detailed write-up on this will follow soon. Compared to last year we had a LOT more family time and better work-life balance, so to speak. 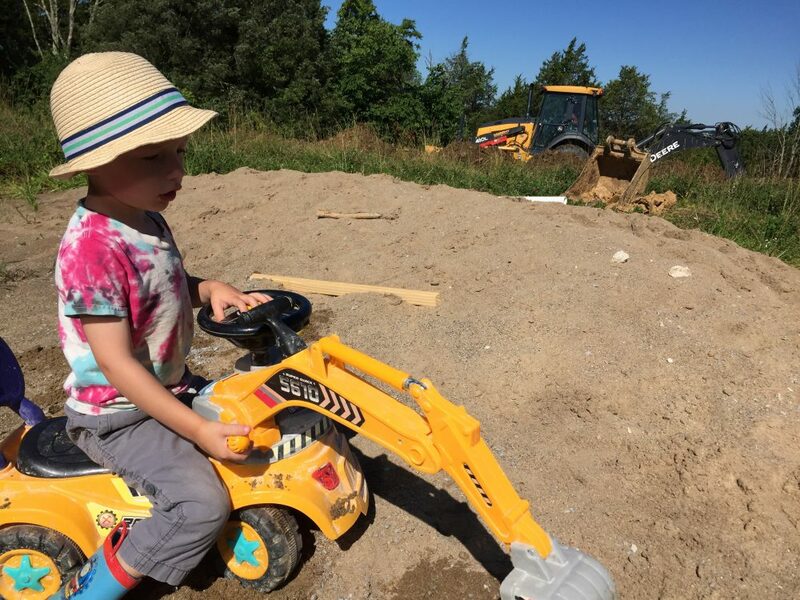 Last year during June so much of our work was too dangerous for our son to be around. This meant that he spent most of the time with grandparents or at daycare. While it kept him safe, it made all of us a little bit short-fused with each other, so we vowed to be much more intentional with our time this year. After all, being able to spend more time with our son is the biggest reason why I left my job. This year our work has been considerably less dangerous, so we’ve been fortunate enough to be able to have our son running around on the property with us. I’ve been particularly blessed to have had several former students come out and help watch him or perform some odd jobs for us. We are currently running the wires for all of the circuits in the house. 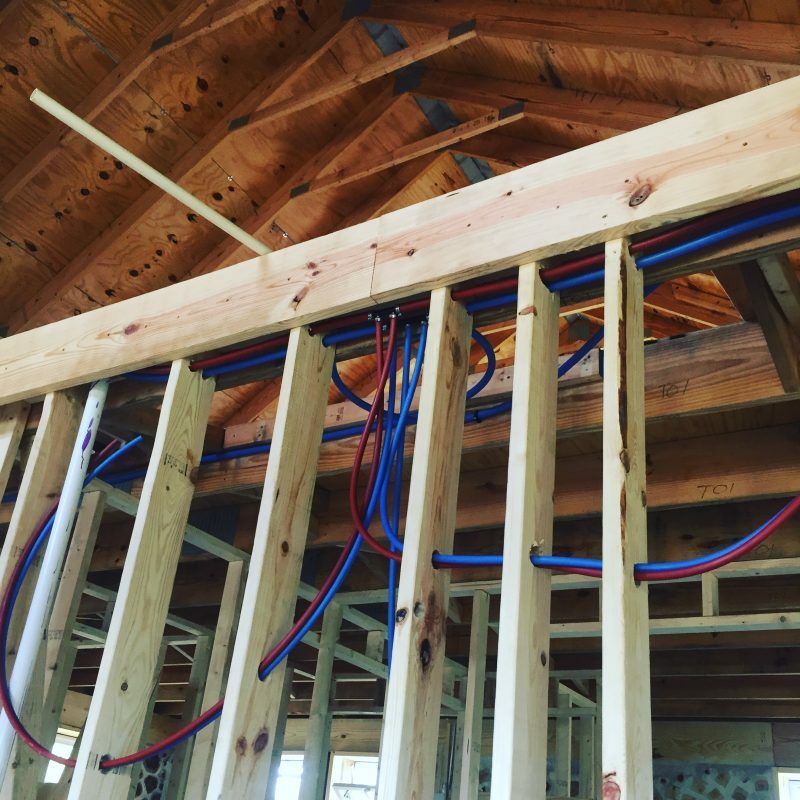 Did you know that our home will be wired up with outlets, switches, and fixtures just like a “normal” home? Just because a home is off the electrical grid doesn’t mean it works that much differently from any other home. We’re going to show you exactly what that looks like as we get all of our systems in order! 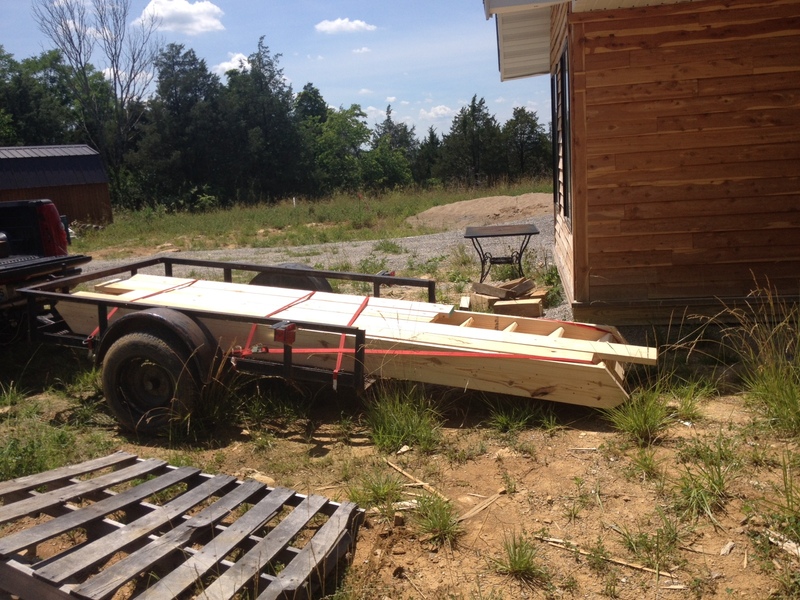 Components for our solar system and hot water/radiant system are slowly being delivered. Now it’s just a matter of passing the next inspection and getting everything hooked together. 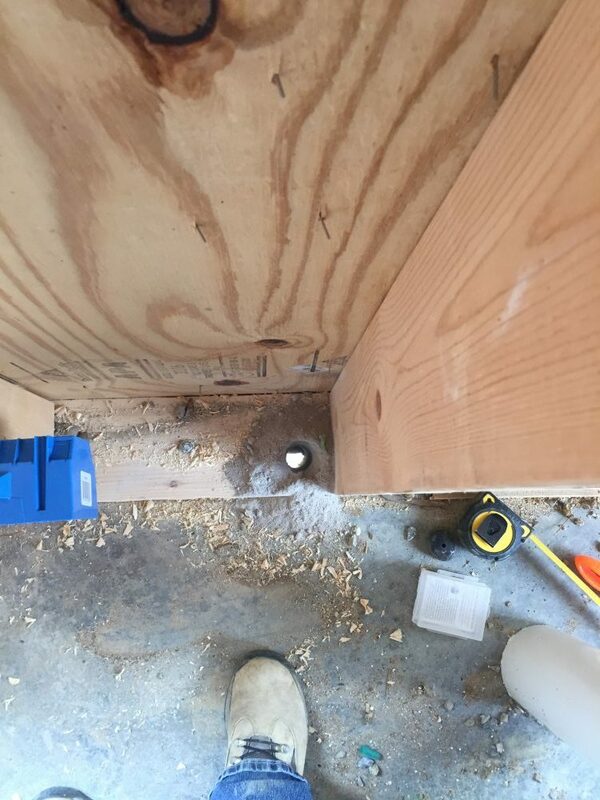 Related: How do you build an off-grid home and deal with inspections? Once we jump those hurdles, we’ll also be able to start the finish work! Insulation and wall coverings are in the not-so-distant future for us now! Previous Post: « Can You Drill Your Own Well For Water?